I’d like to start by addressing the elephant in the room, the notion that Sky Dome / Rogers Centre is not a good place for football. While it’s not one of my favourite places to have watched a game, it’s not at the bottom of the list either. Multi-purpose stadiums (especially ones that convert between baseball and football) are never going to have the same great sight-lines as somewhere like Ford Field that was built for football and football alone. I agree that in the first few seasons, before the team got their act together, there were some truly awful seats available for football. I would know, my family’s seasons’ tickets were moved from being really amazing at Exhibition Stadium to being horrible at SkyDome. The first 10 rows in the 100 level don’t have enough of a slope and left fans staring at the back of players on the sidelines instead of the action on the field. The team eventually realized this and covered up those seats with banners. Apart from that, the SkyDome is not a horrible place to watch football. Sure there have been times when it is agonizingly empty, but that has less to do with the stadium itself and more to do with the people running the organization / marketing and a bad on field product. Toronto football fans are fickle and when the team is crap, they make their opinions known. That said, some of the most passionate CFL fans I know are Toronto Argonauts fans. People who, like myself, have been there through thick and thin, and have felt the highs of winning a Grey Cup at home in 2012, and the lows of 3-15 seasons (1993 and 2009 are the two I remember as being horrible – though nobody really cared too much about 1993 since the Jays won the World Series that year). Don’t believe anyone who tells you that Torontonians don’t like football. They do, but in recent years scheduling woes have made figuring out when the team plays a challenge. The team had a playoff game re-scheduled for a Wiggles Concert in 2004, were forced to have games on Tuesday and Wednesday evenings in the past 5 seasons (hardly a typical night for a football game), and this season were forced to play home games away from home by both the PanAm Games and the Blue Jays’ playoff run. With Rogers Communications buying the Blue Jays in 2000 and the SkyDome in 2004 (renaming it the Rogers Centre in 2005), the Argos have been given the short end of the stick many times. In 2009, the Argos had to play a game without the availability of Alcohol (and that was the season where fans really needed a drink) because of Rogers Centre infractions. What made it worse was that there were 2 Blue Jay games affected by the suspended liquor license but baseball fans were allowed to trade their tickets in for another game while Argo fans were not. Even with the frustrations of the past decade, the SkyDome has been a good home to the team for the past 27 seasons. The 2012 Grey Cup, won by the hometown Toronto Argonauts had an electric atmosphere and the fans who packed the stadium were loud and proud. 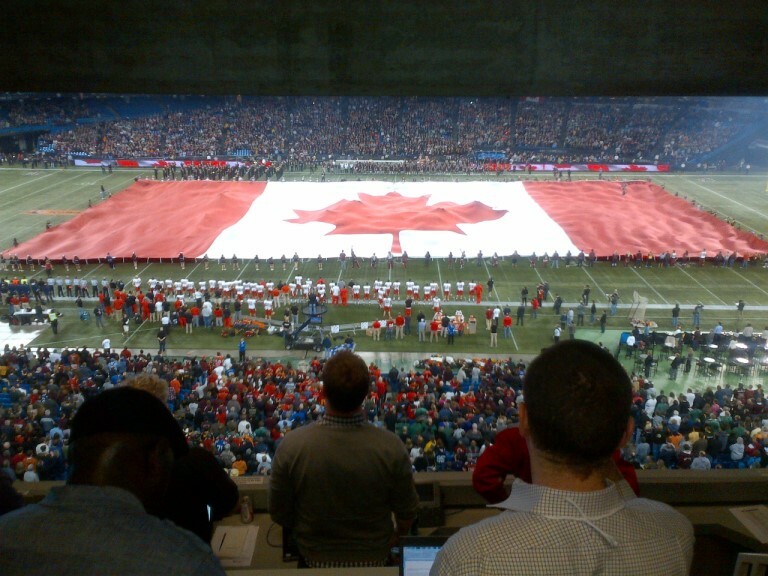 My view from the Press Box for the 2012 Grey Cup pregame ceremony. 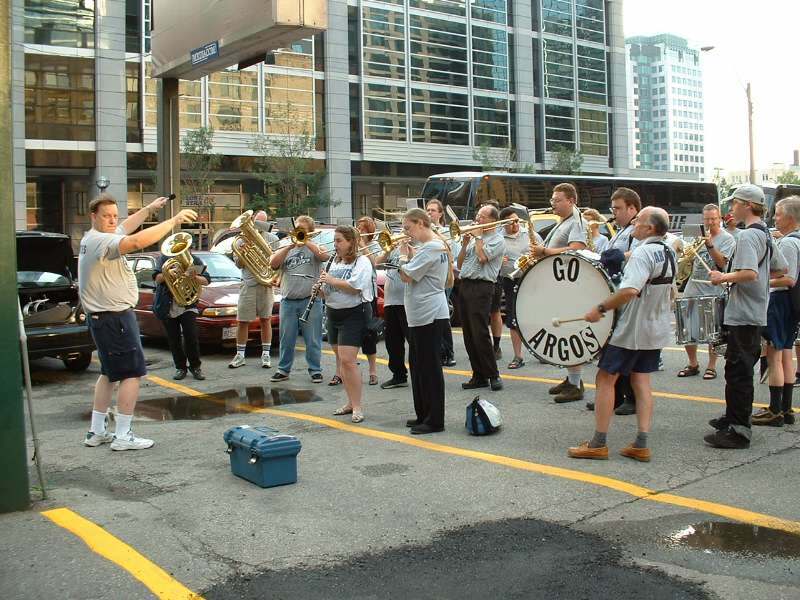 For the past 18 years, I have been attending Argos home games as a member of Argonotes, the official band of the Toronto Argonauts. For someone like me, who adores football and music, the band has been an amazing part of my life. It allows me to combine two of my passions and the people in the band are some of the most fantastic people I know. Skydome has been Argonotes’ home since the band came into being in 1995. Over the years, we’ve played in different locations from section 124, to the stage in the end zone (my favourite location ever), to our current “not real seats but amazing view of the game” seats. 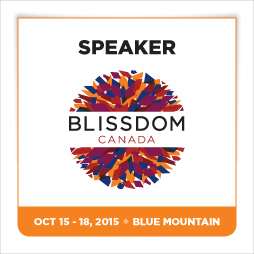 Not that the pleasure of listening to us is restricted to those with seats within earshot. Nope, we’re an equal opportunity band and wander the stadium (usually during the 3rd quarter of the game) and entertain the fans [except the 200 level where we haven’t played in a couple of years because some people complained that we were annoying them]. The band has been a big part of the game day experience in some years, and almost forgotten in other years but the fans always get a show at gate 2 after the game. 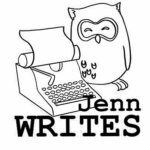 Win (Argos Rule!) or lose (Heartbreak Hotel), the band plays a post-game concert after every home game. I’m going to miss our gate 2 concerts almost as much as our beloved pregame ritual of playing in bars and restaurants along Front Street on our way to the SkyDome from our meeting point at Front and Simcoe Streets. Most of the bars love us, some forget to tell their weekend managers that this happens (which is always fun – the look of shock on the hostess’ face at Lonestar one Sunday afternoon was priceless), and some demand we not play on the stairs close to their restaurant located at the base of the CN tower. 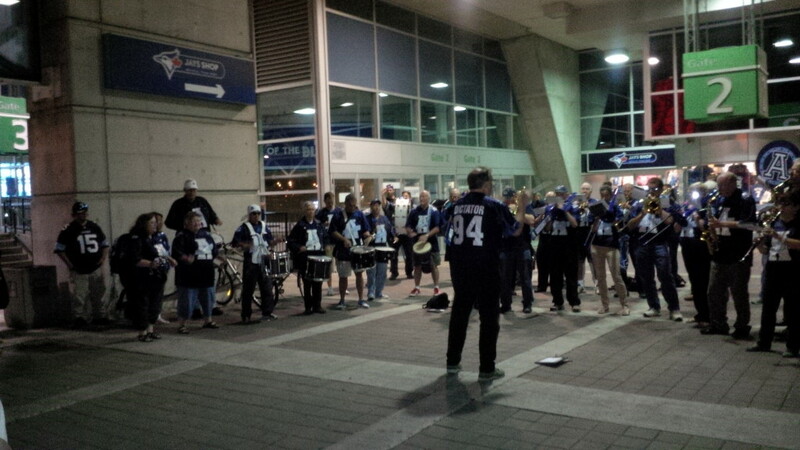 Argonotes outside gate 2 – our traditional post game concert location. Starting next season, the Argos will have new ownership and a new home at BMO Field. I’m excited for an open-air stadium experience, thrilled to be getting away from the scheduling nightmare that has been part of the Argos’ season of late, but also sad that all of my familiar landmarks (and favourite stadium food) won’t be part of my game day experience anymore. The memories, and there are so very many of them, will continue to live on though. Whether it was Pinball’s Last Run in September of 2000, Rickey Foggie’s amazing game in 1990 (7 touchdowns and 100 yards – and he was the BACKUP quarterback), the hometown heroics of the 2012 Grey Cup, Rocket Ismail’s 87 yard kickoff return int he 1991 East Final, or watching Doug Flutie and Pinball Clemons join forces in the 1997 Eastern Final to lead the Argos to the Grey Cup, the SkyDome will always have a place in my heart. Next season, marks a new era for the Toronto Argonauts, one that will hopefully return the excitement the city used to feel about the oldest professional sports team in North America still playing under its original name (and the oldest professional football team in North America). BMO field will be the Argos’ 5th home in the team’s 143 year history and I’m hopeful that the team will re-capture some of the magic I remember from Exhibition Stadium. Tonight, however, I’m heading into Toronto, making the familiar turns towards the SkyDome, meeting up with the band at Front and Simcoe, doing a little bar crashing on the way into SkyDome, playing during breaks in the game (and watching the game when it’s on), and heading outside for one last Gate 2 post game concert, trying to pack a few more SkyDome memories into my heart. ARRRRRGOOOOOOSSSSSS! Photo from Argonotes.com. Our pre-game warm-up / meeting spot circa 2002.